As organizations and the legal and human resource challenges surrounding them are increasing, the need for Accounting, Tax Preparation, Book Keeping, and Payroll Services are more than ever. If you are looking to explore newer opportunities in the industry, Blue Mail Media’s Accounting and Payroll Industry Email Database can significantly expand your presence across some of the most rewarding markets in the world. Our Accounting and Payroll Industry Mailing List connects you with the top professionals in the field and let you explore newer business opportunities. 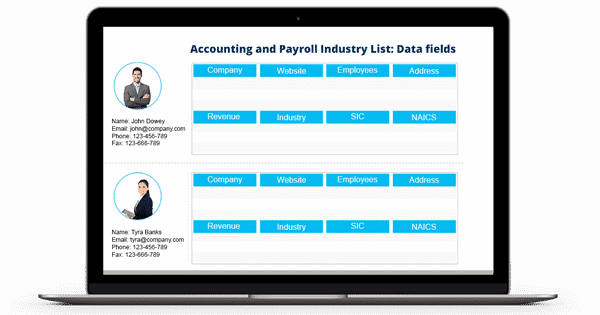 Blue Mail Media’s Payroll Directors, Managers Email List gives marketers access to comprehensive data to help them connect with their target market via telephone, email or mail. We not only offer pre-packaged Accountants and Accounting Professionals Mailing List but also offer to customized mailing database that perfectly aligns with your marketing efforts. Over the years, Blue Mail Media has been able to build a strong network of data partners across the US, UK, Canada, North America, Africa, Europe, Japan and India among other regions to serve clients without any geographical constraints. Using Our Accounting Industry Mailing List, our clients have experienced considerable increase in their campaign response rate, conversion rate and returns on investments. To know more, contact us today!